Author Anjali Joseph. Photograph by Siddhartha Dhanwant Shanghvi. What has life been like since the release of Saraswati Park? I’ve spent some time answering questions or meeting a few journalists, but that apart, it’s been very similar to life before the book came out. I generally work from home, which is either my flat in London or my parents’s apartment in Pune, and I’m usually working on writing fiction, the odd article and review for papers in India and in England, and also on reading for the Ph.D. I’m studying for at the University of East Anglia. The book seems to have garnered a significant amount of praise in a very short duration, which is unusual for most debut novels. I feel lucky that a quiet story seems to have found its readers. 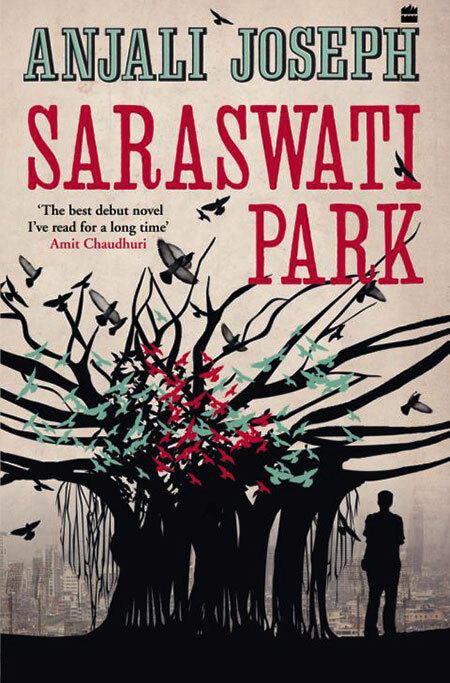 Saraswati Park is your first published novel—could you tell us about the work you’ve done before this? Have you written any novels or short fiction before this book? I’d never completed a novel, but I’d written a lot of stories from childhood onwards and I’d also worked as a journalist at the Times of India (Bombay) and then at ELLE (Bombay), so writing has been both my employment and a private occupation for several years now. The book touches upon the idea of reading secondhand books and “following in the footsteps of other readers”. Do you think the idea of buying/reading secondhand books is romantic? Not necessarily—it’s sometimes just the most economic way of finding a book you need. But I like the element of chance in browsing for secondhand books, and I’ve always liked the idea, in both secondhand and library books, that as a reader you are following the journey of other readers through the pages. Did you speak to any letter writers while researching the book? What was the process of writing Saraswati Park like? I did go and meet some of the letter writers outside the G.P.O. in Bombay and spent a day and a half sitting under their tarpaulin to watch their work. The book isn’t otherwise heavy on research. Mohan is an atypical letter writer; his profile or economic status isn’t that of the real-life letter writers whom I met, but the book is fiction, not reportage. The book took 18 months to write from start to finish. I wrote nearly every day, but not that much, and I rewrote it several times. How did you come up with some of the names for places in the book? The coffee shop ‘Idiot Idiot’ comes to mind, in particular. It was a whimsical joke based on the strange uses of English in corporate language. The book deals with the dynamics of relationships between a younger and older person, and between two young people, and the contrast between the two. Would you like to elaborate on that? Do you mean Ashish’s two love affairs, or his relationships with his aunt and uncle and with his friends? If the element of age enters the question of how people relate, I think what I wanted to render was the way in which who a person is colours his relationships. Ashish is a mix of shy and opportunistic, not surprisingly for his age, and that affects the alternately optimistic and despairing way in which he relates. In school, were you a hard-working student, or did you prefer to wing it? Did you grow up in Bombay? I spent the first seven years of my life in Bombay, and four out of the last five. When I was a child, we lived in the T.I.F.R. complex at the bottom of Navy Nagar. It’s a very un-Bombay setting in the city: Lots of trees, space, a pine grove, and a private rock beach. Colaba is still one of my favourite parts of the city. I also love the area around Banganga, and parts of Bandra and Juhu. Saraswati Park book cover; courtesy of HarperCollins Publishers India. There’s a line near the beginning of the book that says “Only people who’ve had truly happy childhoods can afford to forget about them”. It’s a throwaway thought, but perhaps what keeps taking us back to childhood memories is the sense of some lack or sadness, which is pretty universal. Perhaps a person who was truly happy moment to moment wouldn’t spend much time in the past. You also touch upon the disparity between fantasy and reality. Do you think it’s better to get what you want, when you want it, or to appreciate what life throws at you, and the complexity of real circumstances? Few of us are enlightened enough to choose the complexity of real circumstances, but we rarely seem to have the option of getting what we want at all times. How important is description to the telling of a story? Are details everything? As a reader, what I particularly respond to is a voice, a use of language, and a vision or a presentation of the world of the story. When I’m taken with a particular writer I could read anything she or he writes. I feel like that about Samuel Beckett’s prose writings, or about Upamanyu Chatterjee’s novels. Detail isn’t necessarily the point, but I don’t read for plot in most instances. Exactly what is it about goodbyes, according to you, that makes them so sad? Separation from people and places you’ve loved, and perhaps the awareness that you’ve never loved them quite as much as at the moment of departure. What are you working on at the moment? Is there a second novel in the pipeline? I’m writing another novel, about a group of characters in their twenties. It’s set between Paris, London, and Bombay, and focuses on the emergence or re-emergence of a sense of self behind that of everyday personality. By Urvashi Bahuguna · Teacher, poet, and photographer: Nitoo Das speaks to us in an exclusive interview about writing and performing poetry, and her love of birds.